The concept a 8 years in the making, Had it’s first run in 2014, with three venues, with the goal of finding new talent while providing an audience on weak nights to participating entertainment venues. All getting several first round preliminary shows, as well as “playoff” & a chance at hosting the Finals. 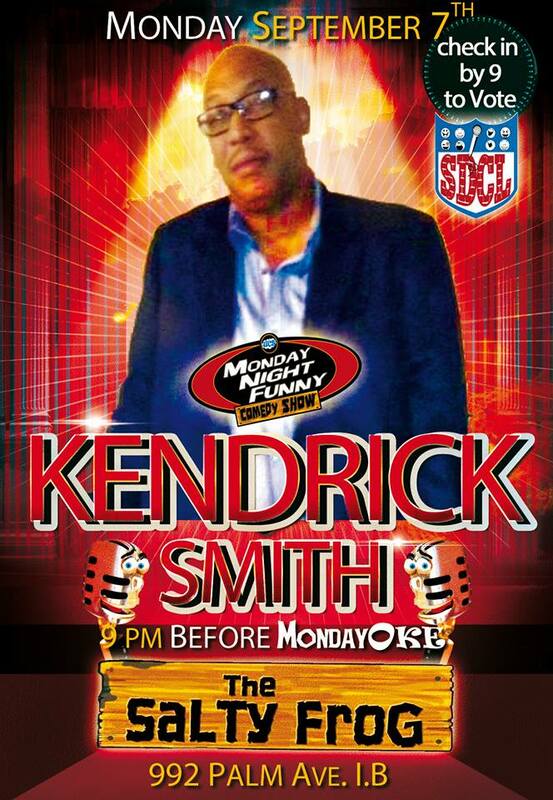 The first Round & wild card shows are No Cover, (the age depends on venue). While Semi & Finals have a donation/Cover. • The contest is free to compete, Anyone (under age comics will wait outside venues where they cannot enter). 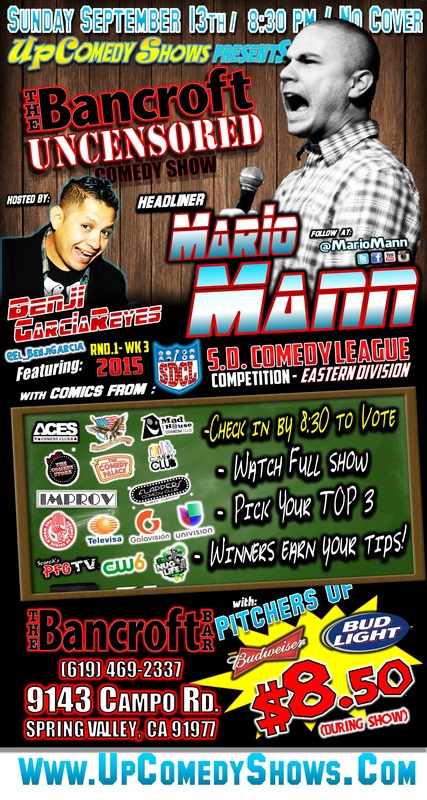 • Each comic is allowed (& encouraged) to participate at least once in each of the League Venue round 1 shows. • Comics get 6 minutes in the first round. More in following rounds. • There are 8-10 comics per 1st round. • All venues get one Playoffs show. 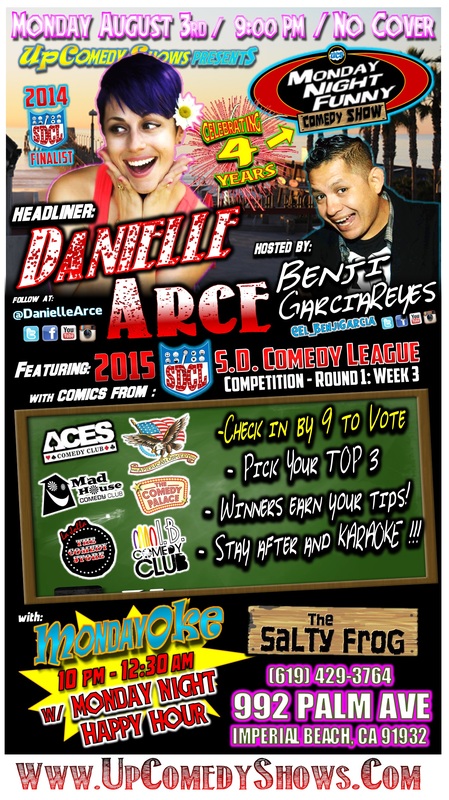 • CHAMPIONSHIP will be held at San Diego’s The Comedy Palace. 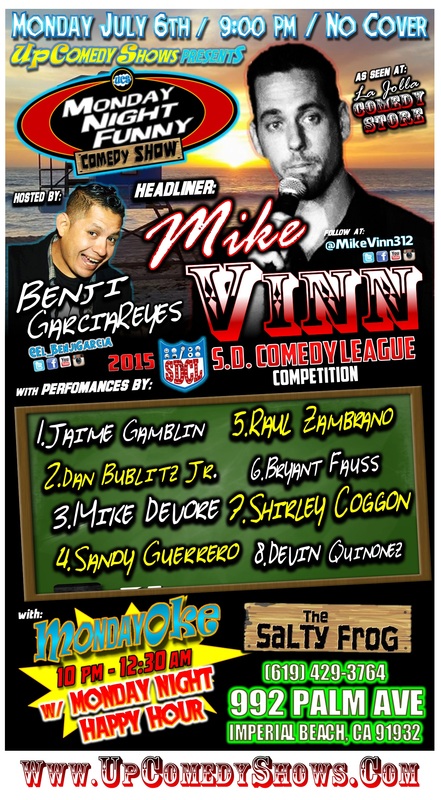 • Comics advance to playoffs by winning(being top comic) a Round 1 show. 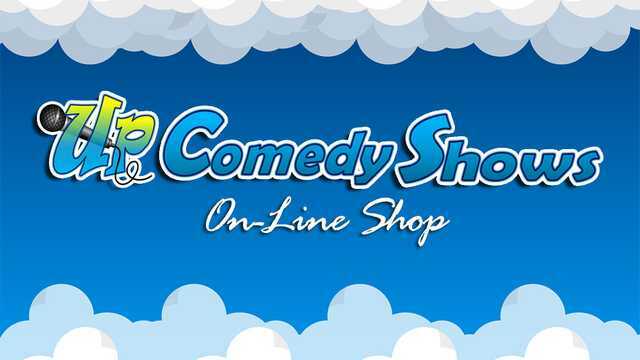 The earn Cash prize TBDL & future stage time in SDCL & Up Comedy Shows. • Comics that do no win round 1, can advance via season points, top comics get in to wild card round. 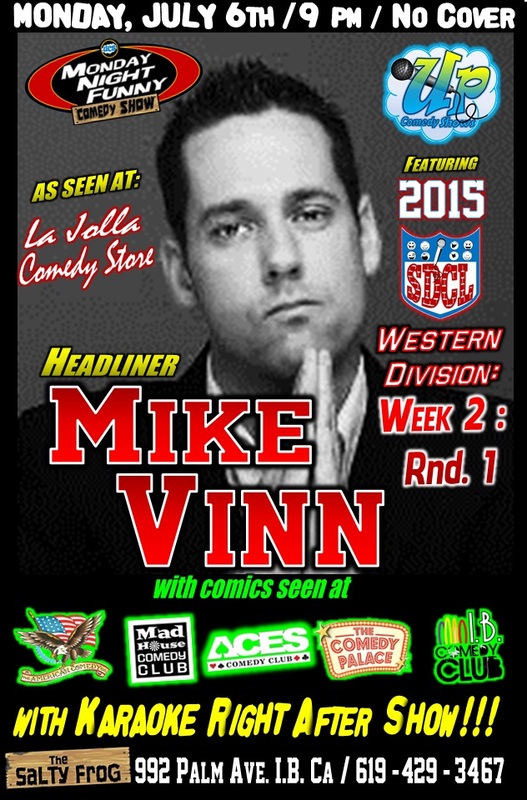 • Points are earned via audience, Venue & Up Comedy Staff during shows. 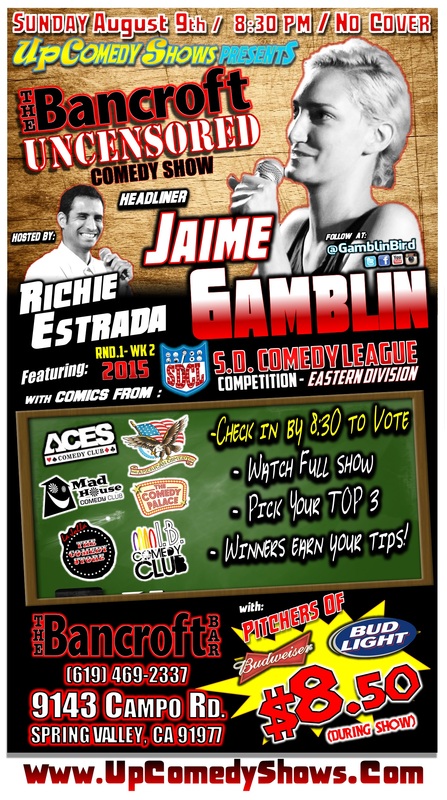 • Votes are tallied via paper ballot with Top 3 comics name & rank #. The top 3 are picked from a combination of AUDIENCE VOTE, JUDGE VOTE & LAUGH COUNT. •No-shows will be disqualified (emergencies happen contact u s). 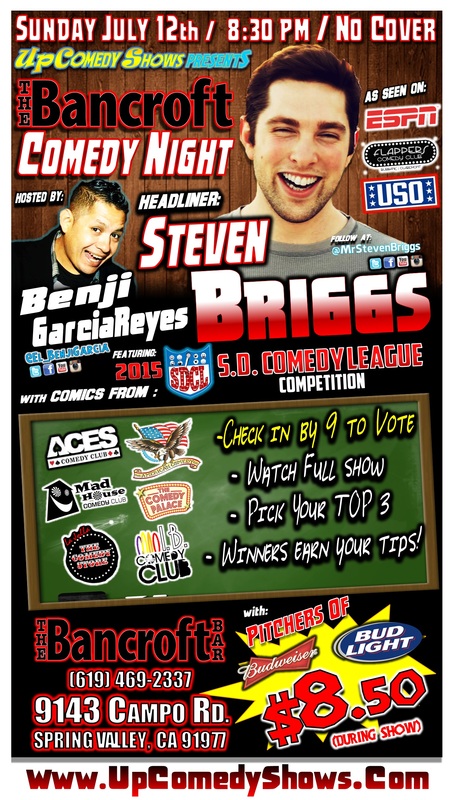 •The Cash for prizes (both nightly & Winner Pot) will be acquired from Tip buckets/Donations, door covers &/or Bar sale %, and will be updated on the San Diego Comedy League Website after each show along with results, other stats & if available video highlight.